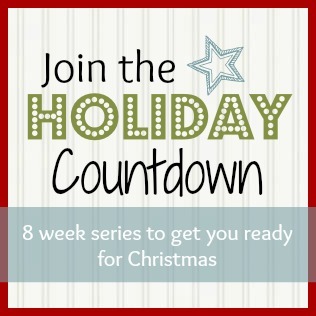 Last week I kicked off the Holiday Countdown Series, which is a recap of last year’s plan for staying on track while preparing for Christmas. I was happy to hear that many of you are planning on following along and want to thank you for spreading the word. If you wrote (or plan on writing) about your own holiday preparations, make sure you send me the link and I’ll add it to next Friday’s post (same goes for each week leading up to Christmas). Since last Friday, I have been working on a few projects I’ll be sharing in the coming weeks. I am up to date on last week’s list, except the Christmas lights, which will hopefully be going up this weekend (weather pending). 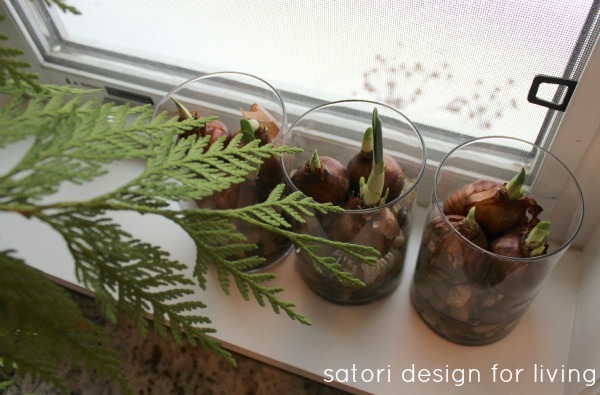 To tell you the truth, all I had to do this week was plant my bulbs, since we had already completed the other items on last week’s list beforehand. Rita from Harbour Breeze Home told me about forcing bulbs in a glass jar or vase with water and no soil. I decided to look into it a little further and I’m giving it a try this season. It’s your turn to host Christmas this year and you realize on December 15 that you’re not going to have enough seating for everyone. So what do you do? In a panic, you decide that you need a new dining table and chairs. Guess what? It’s highly unlikely that it’s going to happen unless you’re willing to settle for whatever you can buy off the floor. Most furniture orders have a lead time of 6 to 8 weeks and sometimes longer. I had a client in the past who was really disappointed when I told her the new chairs she wanted were scheduled to arrive the first week of January. As luck would have it, they showed up the week before Christmas and she was ecstatic. Don’t count on this happening for you. Clean and stock the kitchen. Now is the time to clear out the fridge and freezer and give them a good wipe down. You’ll also want to clean and organize your pantry before you start loading it with holiday essentials. I don’t know about you, but I try to limit my trips to places like Costco, Wal-Mart and grocery stores when the holiday frenzy really gets going. I like to stock up on baking supplies, wine and other beverages, meat, seafood, cheese, appetizers, napkins and anything else we may need for everyday living or entertaining. If you notice an item you use frequently is on sale, buy multiples to get you though until the end of the year, but only if you have the storage room. Decide on a decorating scheme. How many times have you been gift shopping and stumble upon decorations that immediately grab your attention and you purchase them on a whim? Then you return home and they don’t seem to look as good as they did at the store. Retailers are clever at putting just the right mix of decorations together, using colour, texture and scale. If you pay attention, certain colours and/or styles are grouped together throughout the store. Notice what you’re drawn to and stick with it. If you love the decorations you already have, add a few new ones to complement that style. If your preference has become the complete opposite of what you currently have, consider donating those items and starting fresh or picking only one room to update this season. Perhaps you’re drawn to traditional Christmas decorations, such as red, green and gold. Or you’d like to keep your space neutral by adding sparkle with glass, crystal and metallic decorations. Or you prefer a contemporary Christmas scheme, such as black, white and turquoise. Whatever you choose, your decorating outcome will depend on honing in on the look you’re after. Limit colours to three to prevent it from looking garish- its okay to mix in a variety of neutrals or metallics. 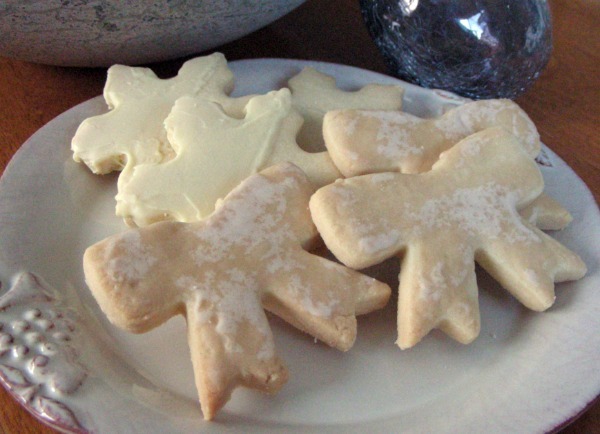 I’ve never been one to create a vast array of goodies for the holidays. I usually find the time to whip up some caramel popcorn, biscotti and chocolate-covered pretzels, but that is it. Some people go to great lengths to host a party for the event. Last year I swapped cookies and recipes with one of my friends over a cup of coffee, and this year, I’m hoping to add one more friend to the mix. If you want to find out more about planning a cookie swap, check out Simple Mom’s tips on how to host a memorable cookie exchange. Have you started preparing for Christmas yet? I’d love to know what you’re up to. i am so bad- i usualy decide on my scheme as i pull decorations out of the boxes! ba ha ha! no but really i am thinking of removing a lot of the blue i usually use and going with a more classic red, white, and bling! I really only started doing a “scheme” 2 years ago. I keep everything neutral and select a pop of color to make it interesting. I also throw in a bunch of natural elements. I really weeded out my old decorations, which were mostly country style from years ago. I think you’ll like the change. Great series Shauna! I have decorations I’ve used for years, and that we had growing up. This year has been hectic so I’ll probably end up using the same decorations again this year. After Christmas, I hope to get some decorations on sale to update my scheme. Which is in need for an update very badly! Thanks for the tips! After Christmas or even the week leading up are great times to buy for next year. I have a whole bunch of mercury glass ornaments I bought at 75% off over the past couple years. A good deal always makes me happy! I’m trying something a little different with my bulbs this year. Thanks for the heads up. I’m crossing my fingers it works, but bulbs are always unpredictable! I haven’t started baking, or cleaning/organizing yet. But I have started making some new decorations for the home. And a couple of presents are in the works too. I’m sticking with the same colours I’ve used for a few years, I love it and have bought a few new ones each year so I’m not prepared to get rid of all these. I think starting on anything at this point is a good idea and will have you way ahead of the game. As far as ornaments go, if you love them, that’s really all that matters. 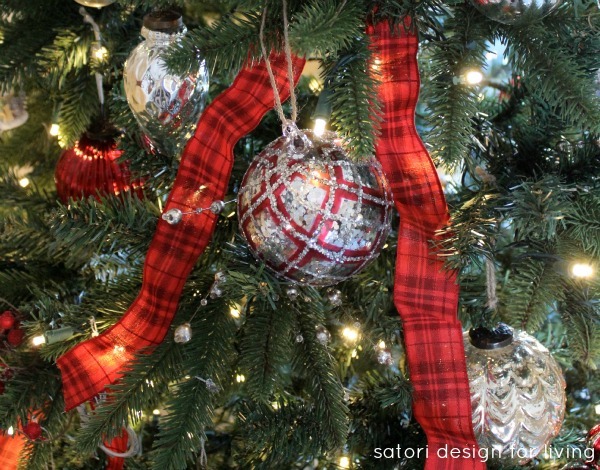 I have some basic metallic and white ornaments that I use every year and then mix in a pop of color that I change up from year to year using ribbon and a few inexpensive colorful ornaments. This is really great, Shauna! I’m going to need a little bit of help this year to stay on track, because I’m studying for an exam I write in Dec. 15th :-( So between studying, blogging, and trying to DIY a thing or two, my head is full and my days are flying by! I appreciate this countdown! Good luck with everything! What are you studying? Thanks for the organizing tips, Shauna! I got my paper whites planted last week, too. Off to check out your Pinterest ideas for holiday decor, I loved the ones you’ve shown!